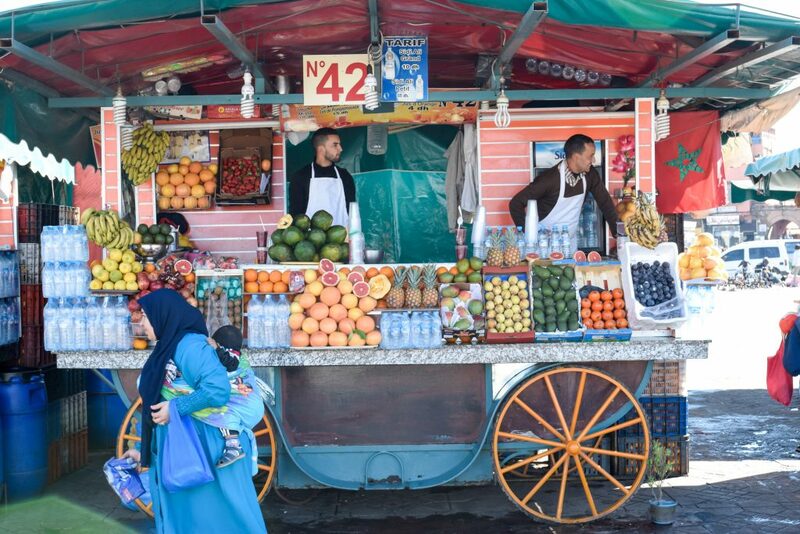 I can’t think of anywhere I have enjoyed traveling to more than Marrakesh, Morocco. We spent five beautiful days there, but we surely could have spent fifty more. With its village-like feel and European sophistication, it feels like the perfect Asia-Europe fusion, and that is why we loved it so much! 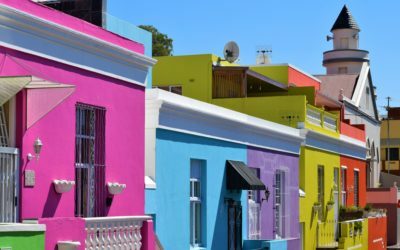 Each city in Morocco has its own unique character. 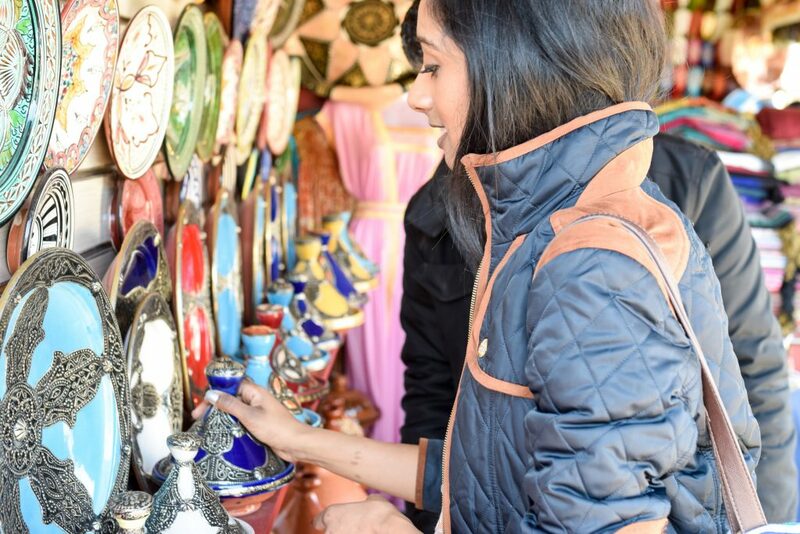 If you’re planning a trip to Morocco, I insist on visiting Marrakesh –- not only home to various historic mosques, it also has breathtaking palaces, gardens, and souks (marketplaces) filled with vibrantly colored treasures of all kinds. If you’re a shopper, tourist, hiker, foodie, or fashionista, this place is for you. 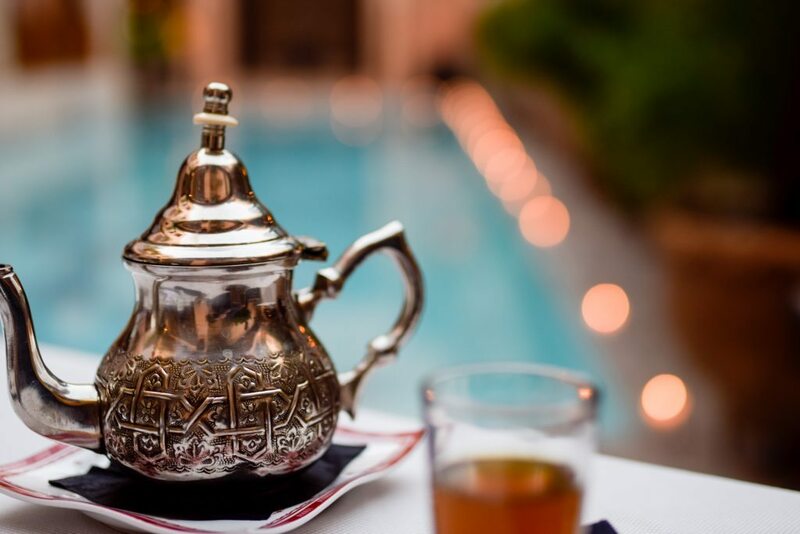 In the next few paragraphs, I detail some of the things you absolutely cannot miss on a trip to Marrakech! Well this was an experience, that’s for sure. The streets are lined with stores as far as your eyes can see. The markets are open from around 9:00 a.m. to 9:00 p.m., but the best times to visit are either in the morning or evening with ample daylight and minimal heat. 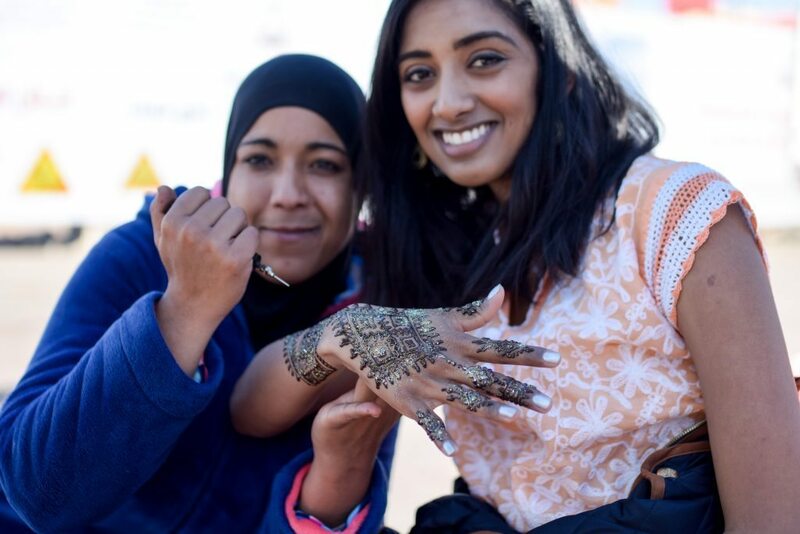 In the first hour of our scavenging, we bought two dresses and one pashmina, and I had Henna done. But it wasn’t as simple as walking into a store and putting things into your cart — oh no, it couldn’t have been more different. Be prepared to haggle, friends. If you’re not familiar with haggling, it’s basically not accepting the first…or second…or a tenth of the price a shopkeeper gives you. 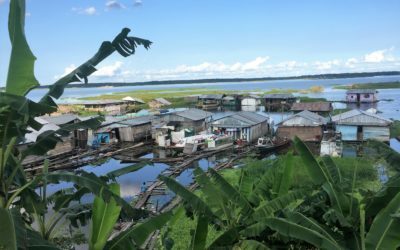 We were privy to the fact that opportunist merchants added a “tourist tax” to multiply their profits by as much as four times the fair price. Since there are no price tags on anything, you really have no idea how much things will cost. And fight for it! Also, have the strength to say “NO”. I’ve never seen shoppers chased down the road by shopkeepers before, but this was common in Marrakesh. If you look interested in something, they will be so persistent; crack under the pressure or find the ability to say “NO!”. 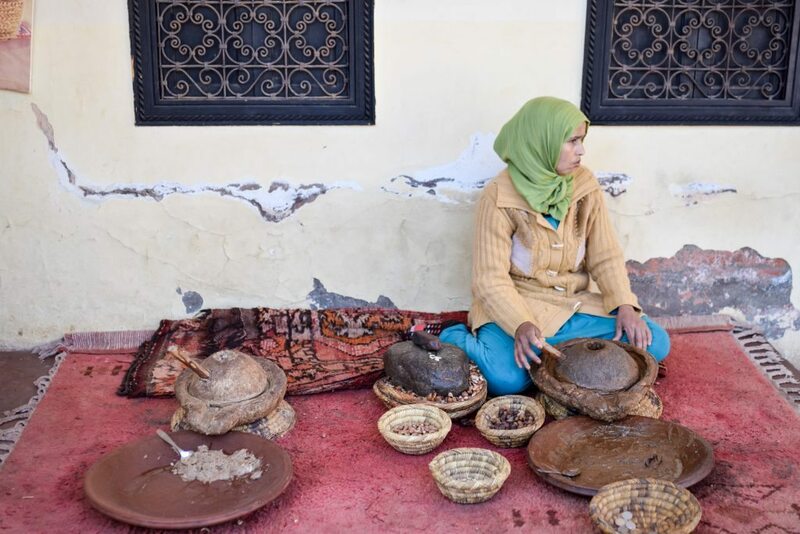 My husband is such a fierce haggler and no-sayer, thank the Lord, but if I had been there by myself, I’m sure I would still be stuck in the Souks. According to Booking.com, this is the nicest hotel in Marrakesh. I completely…agree. Holy WOW this hotel was a bit of heaven and the perfect blend of Moroccan ornamentation and European elegance. Don’t even consider booking anywhere else. This hotel itself was a historical sight to see, and there is so much to do within it! 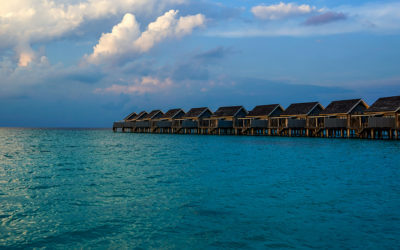 With so many amazing amenities, we could have spent our entire vacation enjoying this palace. 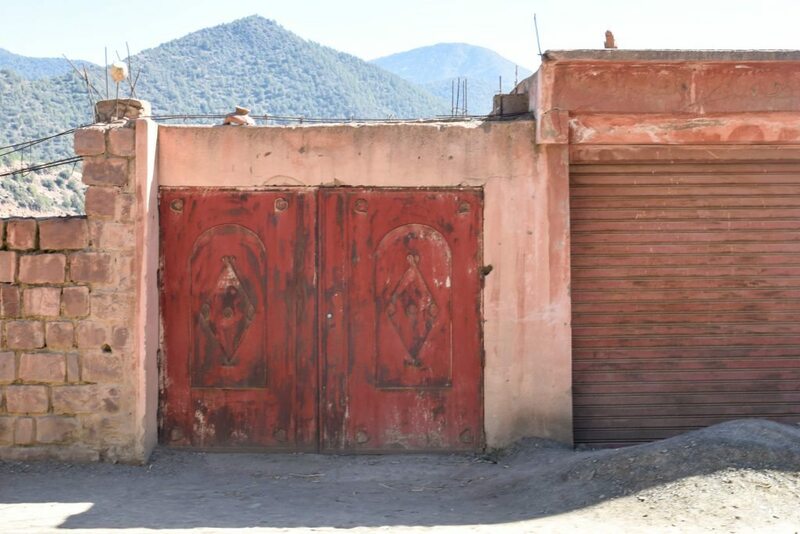 Deciding to venture to the mountains, we hired Mustapha Aderraz from Moroccan Trail to take us on a full-day, guided hike through the famous Ourika Valley. He picked us up from our hotel at 9:15 a.m. sharp and we hit the road immediately. Besides being unbelievably friendly and kind, he hosted us to a great tour. After a 45-minute drive and a much-needed coffee break, we found ourselves in the mystic Atlas Mountains at a traditional Berber home. He toured us through the traditional “mountain-man” home, where we were served fresh Moroccan tea and bread, and spoke with the hosts still living in its ancient walls. We also enjoyed the freshest olive oil, butter, and honey we’d ever had to accompany the bread. The part that stuck out moost (misspelling intended) of all were the cows (now you get it). I could not believe that, even today, there could be cows in the middle of a house. 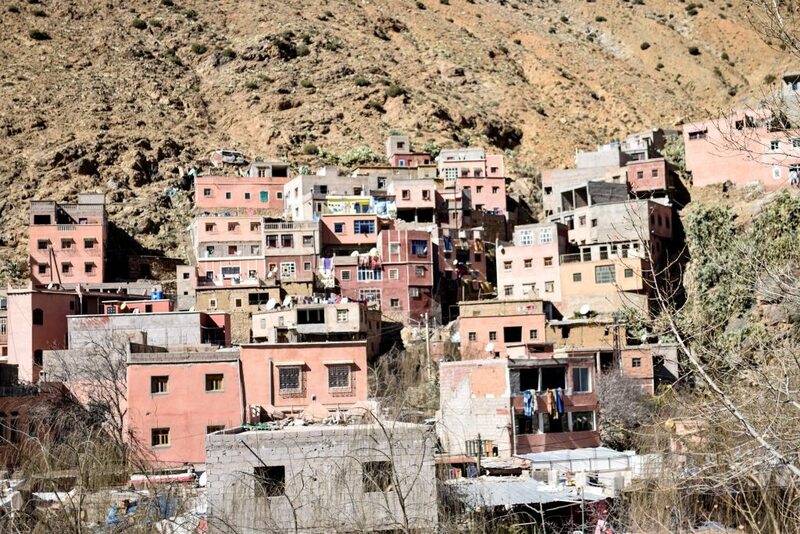 But then again, this is was a traditional Berber home. 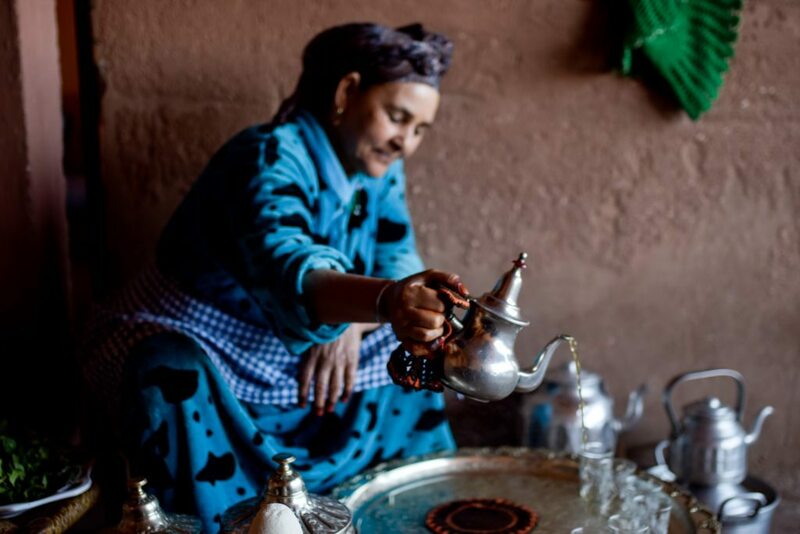 The Berber culture is fascinating, and I know you will enjoy learning about them just as much as we did! 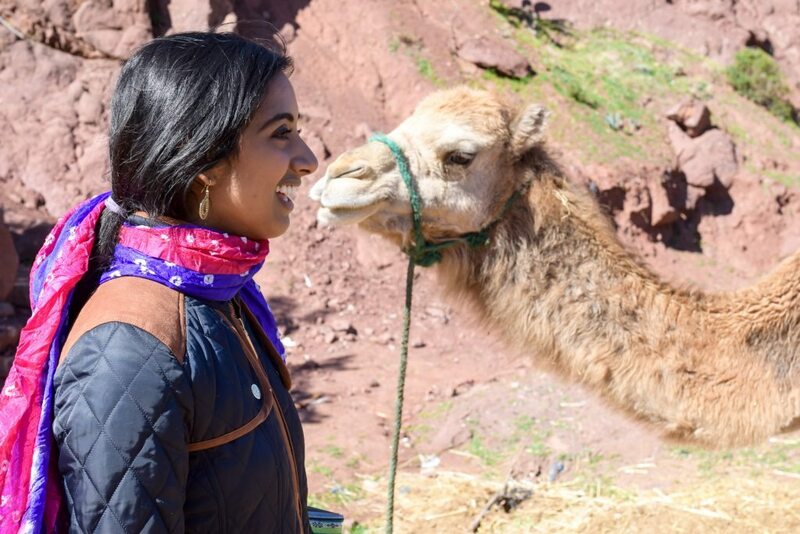 After our lovely camel ride and our drive through the countryside, we met up with a guide in Ourika who took us up the Atlas Mountains. We walked for a while — enough to work up a significant appetite. If you’re a hiker, you still might find this hike a little more difficult than usual –- the very slick, water-worn rocks made steady footing rare. The best part was watching all the people wearing dresses, flats, and sandals (basically not hiking clothes), yet still making it to the top. You go, girl in the floor-length dress! During our hike we stopped at multiple cascading waterfalls. We even took a picture where most of my body is cut off thanks to the waterfall taking center stage. I won’t be mad about it though. 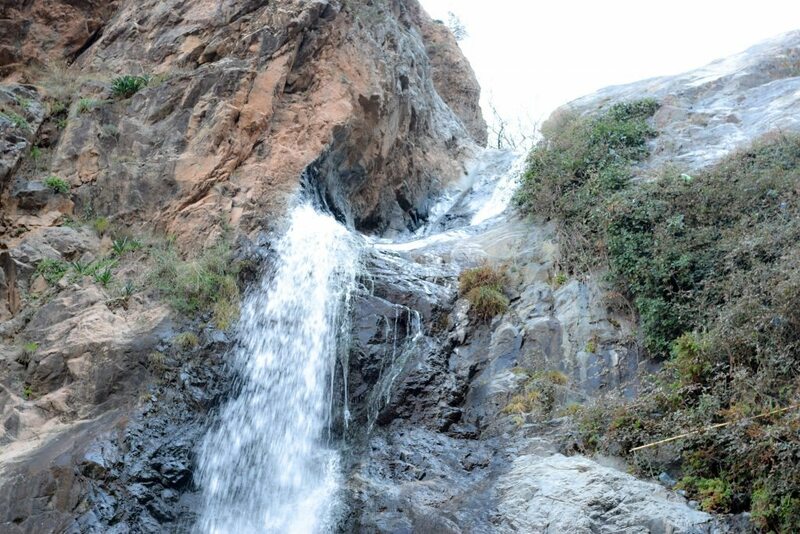 At the top of the waterfall, there is a cafe, so you can enjoy a refreshing cup of Moroccan tea and listen to the rage of the waterfalls. Totally worth it. 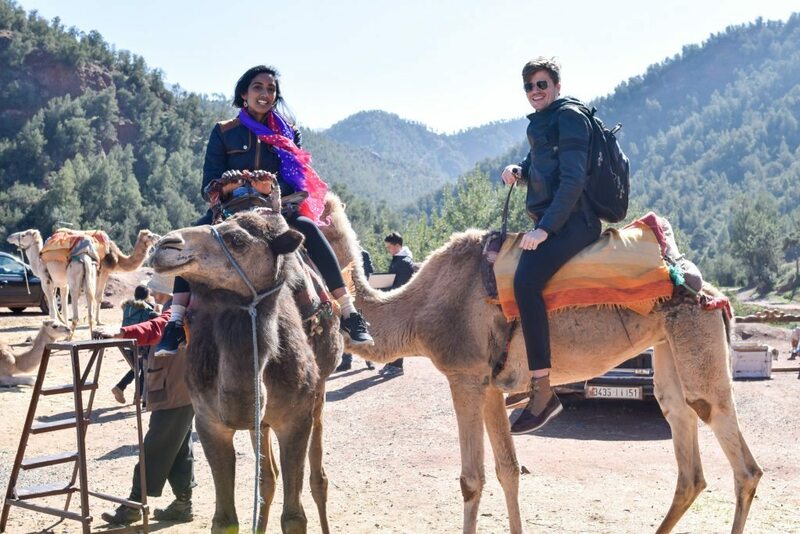 This was obviously one of the highlights of our time in Marrakesh. I mean helloooo, the whole activity was centered around deliciously spicy food! 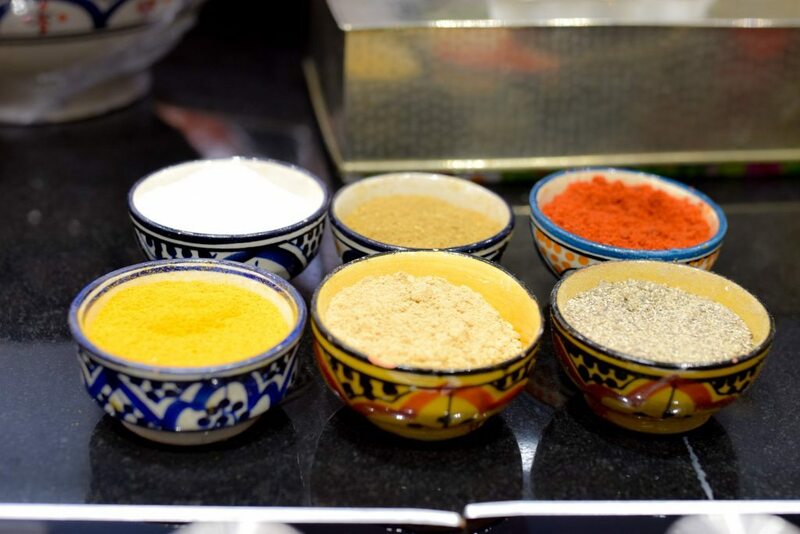 When we first got to the cooking class, the host introduced all the different types of spices we would be cooking with and gave us the recipes along with fresh tea to drink. 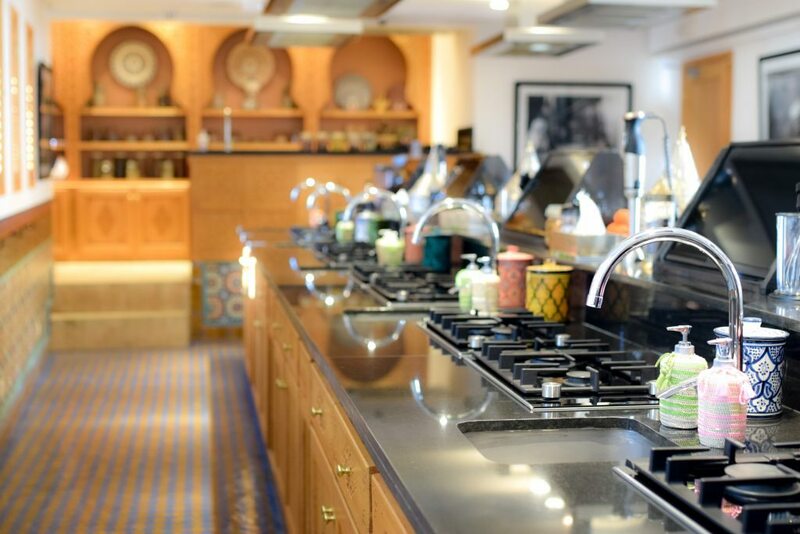 After she explained traditional cooking practices, we went upstairs to a private kitchen where the DADA (head chef) led us through cooking multiple dishes. They had everything ready for us to slice, dice, and sizzle. After a few hours of cooking, we took all of our freshly prepared items and sat on the rooftop, looking out over Marrakesh and enjoying the fruits of our labor. An absolute DREAM. The recipe cards are nice and sturdy too, so we will definitely use those again in the future. Wow. I had never experienced a Hammam before, and this was definitely a highlight of the trip. 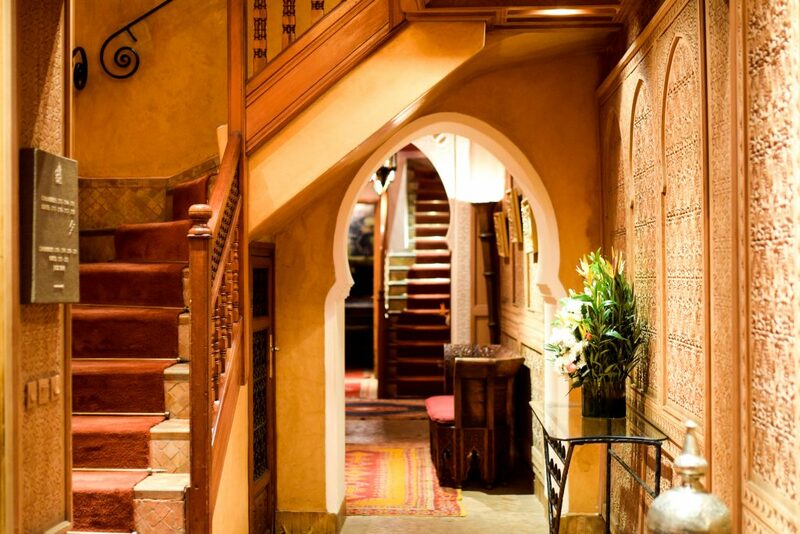 If you don’t know what a Hammam is, reading up is a good place to start. A Hammam is a steam room, similar to a Turkish bath, where Moroccans venture often to cleanse themselves. 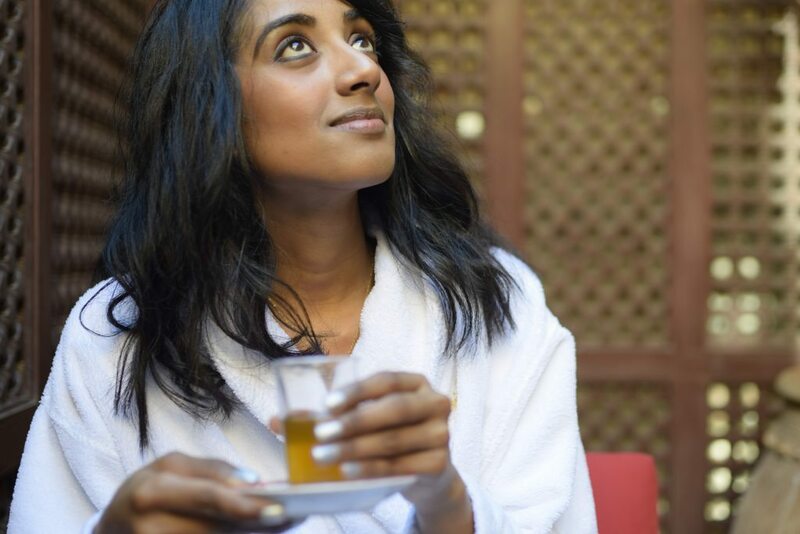 We spent an afternoon at the Hammam at our hotel, and it was AMAZING. We were cleansed, covered in clay, cleansed, covered in scrub, exfoliated vigorously with a porous glove, covered in oil, cleansed, and then dried off. It was pretty darn gross to see how much dead skin fell off of us after the scrub, but all I can say is that it is 100% worth the experience. We both were glowing afterward and felt amazing. 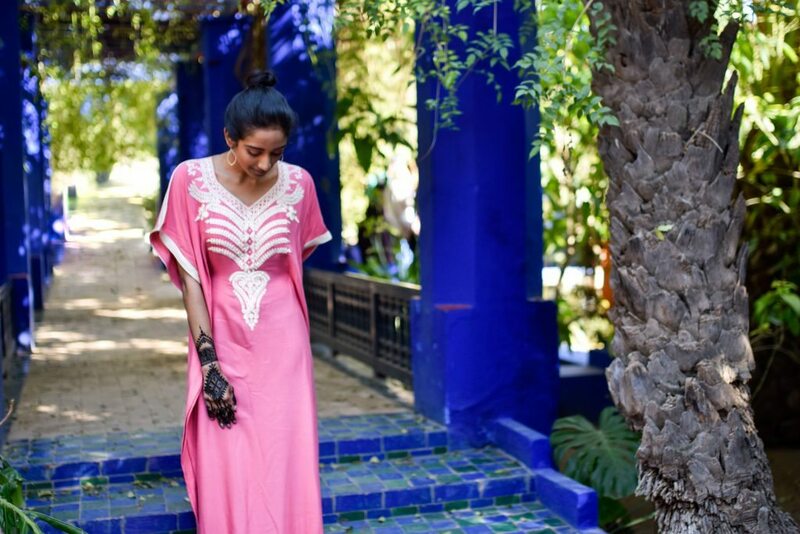 Also, now I know why Moroccan women have such incredible skin! The oils, scrubs, and rinses leave you hydrated, moisturized, and glowing. 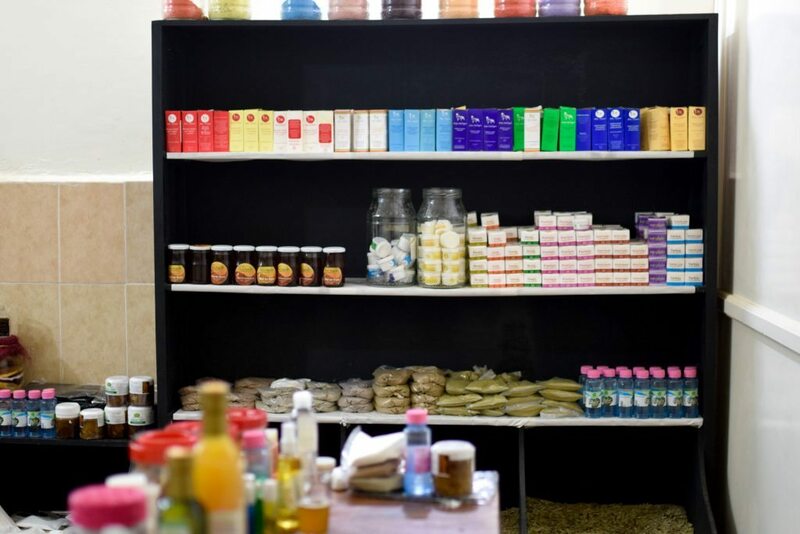 Do not miss out on a Hammam experience, especially in Morocco! Or the fresh tea and cookies that are served alongside. When we weren’t enjoying everything that our hotel had to offer, we walked around the city of Marrakesh. I felt like I was in India again. People stared, because why not? Little stores and restaurants lined the sides of the roads. A couple of times, people came up to me and said, “India? India?” And I was like “…Yes….” but that’s as bold as the passersby got. For the most part, we were able to walk around without being disturbed. On our first day, we walked from our hotel to Jamaa el Fna, the square and marketplace in Marrakesh’s Medina quarter (old city). 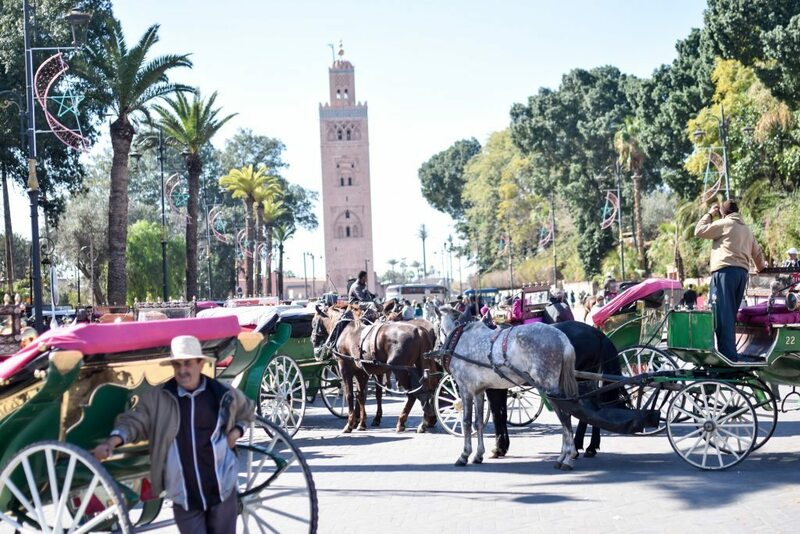 In Marrakesh, there is the new city and the old city. As it’s the main square of Marrakesh, Jamaa el Fna is filled with shops and, inevitably, tourists. 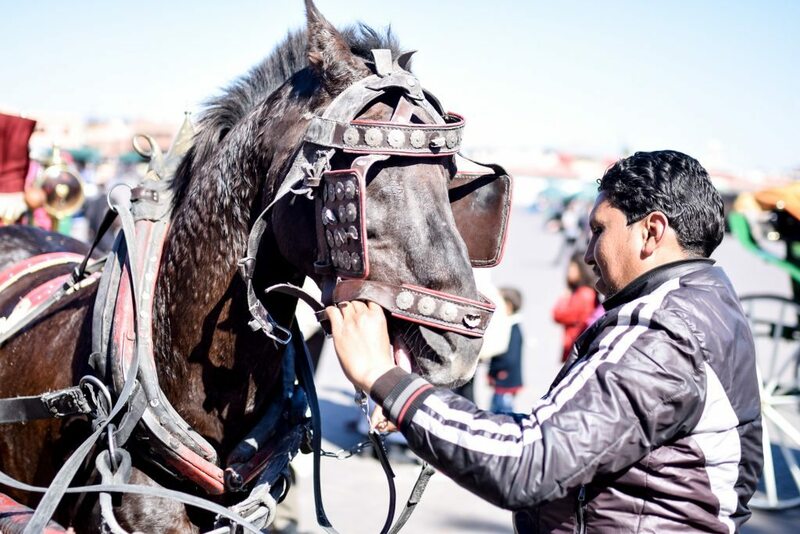 While walking through the square, we noticed tens of horse-drawn carriages available for rent. We rented our own and took a tour of the new city. This was a really nice way to see other parts of Marrakesh without having to walk in the heat of the day. The horse ride was 45 minutes long and cost 100 Durham ($10 USD). Worth it. 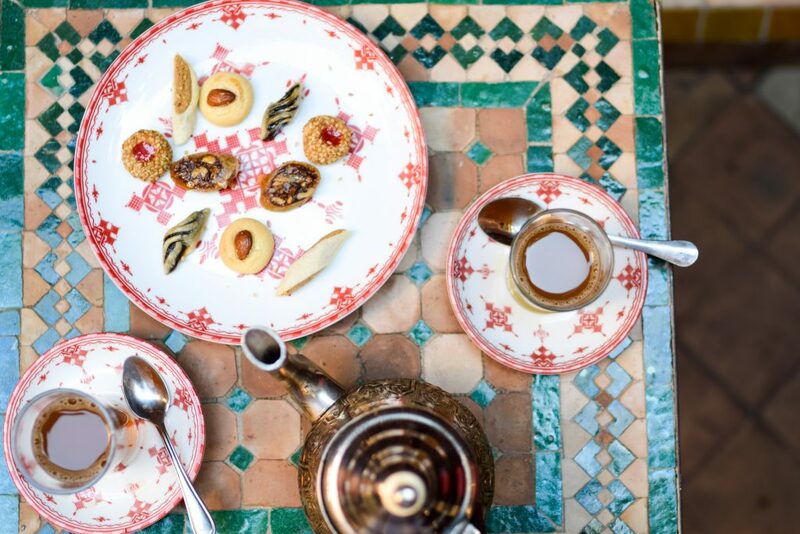 Ranked as the #2 thing to do in Marrakesh, this garden was high up on our list of places to check out. I think we experienced it at an unusually high-traffic time (Sunday afternoon), which, with its small size, isn’t adviseable. But the garden itself was stunning. Students receive discounts there, and you can buy your tickets online before you go. We took a taxi from our hotel, bought our tickets there, and got lost in the green garden and vibrant, blue accents. You will see all sorts of plants and bold colors in every nook and cranny. 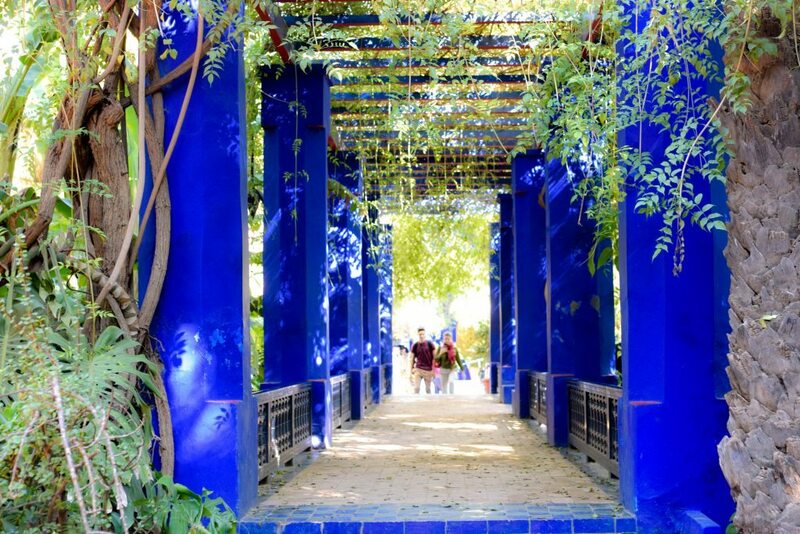 The special shade of bold, cobalt blue is signature to this place and its creator, Jacques Majorelle. Since 1980, the garden has been owned by Yves Saint-Laurent and Pierre Bergé. 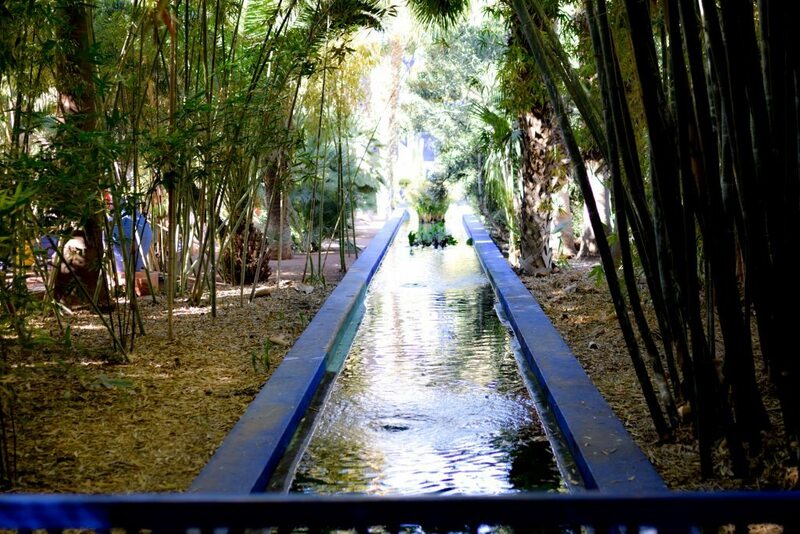 After Yves Saint Laurent died in 2008, his ashes were scattered in the Majorelle Garden. His monument in the garden was an especially popular attraction. You can easily take a taxi ride back, as there is a line of taxis waiting outside at all times. 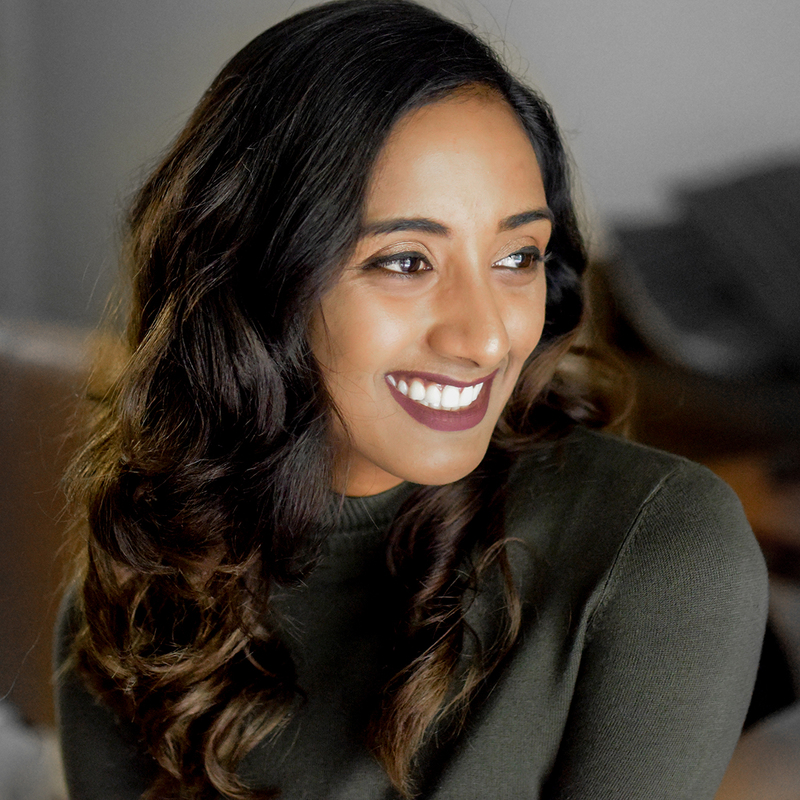 Shruthi Parker’s lifestyle blog is her voice, and that voice is authentic, passionate, sassy, informative, vegetarian, in-love, and well-traveled. Her content is categorized by day so she covers marriage, travel, eats, thoughts, style, and faith! Currently, she lives in Austin, TX with her husband and two fur rascals.